The Borodin Quartet’s particular affinity with Russian repertoire was stimulated by a close relationship with Shostakovich, who personally supervised its study of each of his quartets. Widely regarded as definitive interpretations, the Quartet’s cycles of the complete Shostakovich quartets have been performed all over the world, including Vienna, Zurich, Frankfurt, Madrid, Lisbon, Seville, London, Paris and New York. In recent seasons the ensemble has returned to a broader repertoire, including works by Schubert, Prokofiev, Borodin and Tchaikovsky, while continuing to be welcomed and acclaimed at major venues throughout the world. The Borodin Quartet was formed in 1945 by four students from the Moscow Conservatory. Ten years later, it changed its name from the Moscow Philharmonic Quartet to the Borodin Quartet. 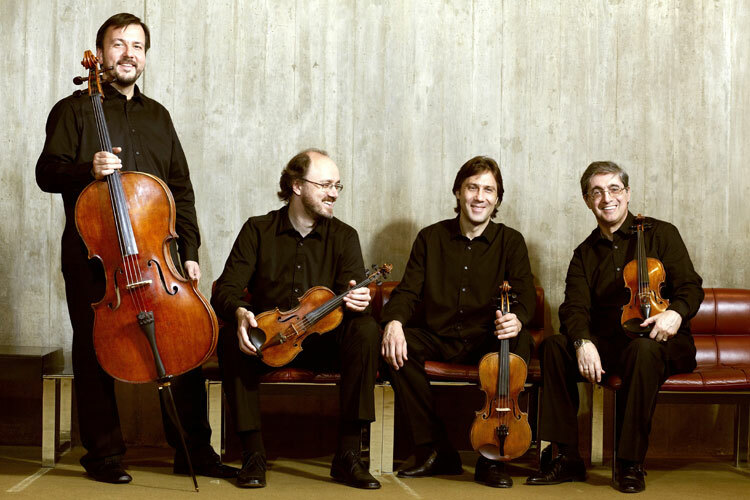 The current members of the Quartet are Ruben Aharonian, Sergey Lomovsky, Igor Naidin and Vladimir Balshin. In addition to performing quartets, the members of the Borodin Quartet regularly join forces with other distinguished musicians to further explore the chamber music repertoire. Their partners have included Yuri Bashmet, Elisabeth Leonskaja, Oleg Maisenberg and Ludmila Berlinskaya. The Quartet also regularly gives master-classes. Recent and future engagement include recitals in Madrid, Rotterdam, Chicago, Brussels, Geneva, Munich, Lisbon, Barcelona, Athens, Köln, Istanbul, Zurich, Berlin, Moscow, Montreal, New York, Tokyo, Shanghai and London, playing the music of Mozart, Schubert, Brahms, Tchaikovsky, Stravinsky, Shostakovich – and of course Borodin. The Quartet’s first release on the Onyx label, featuring Borodin, Schubert, Webern and Rachmaninov, was nominated for a Grammy in the 2005 “Best Chamber Performance” category. The Borodin Quartet has produced a rich heritage of recordings over several decades, for labels including EMI, RCA and Teldec. Among its Teldec recordings, those of Tchaikovsky’s Quartets and Souvenir de Florence, Schubert’s String Quintet, Haydn’s Seven The Seven Last Words of Christ and a disc of Russian miniatures all received acclaim. The Tchaikovsky disc was honoured with a Gramophone Award in 1994. The CD label Chandos recorded and released the complete Beethoven quartets as part of the sixtieth anniversary celebration.